At Mahalo Painting, we educate our customers about the benefits and uses of garage floor epoxy, as it has many benefits that other kinds of concrete paint and garage floor paint may not provide. Having an epoxy garage floor coating applied is extremely beneficial if you are looking for something durable and tough that would give shine to your otherwise dull garage or workshop. A thick coating of garage floor epoxy also does a great job of covering over minor imperfections such as small cracks and dings in the concrete. 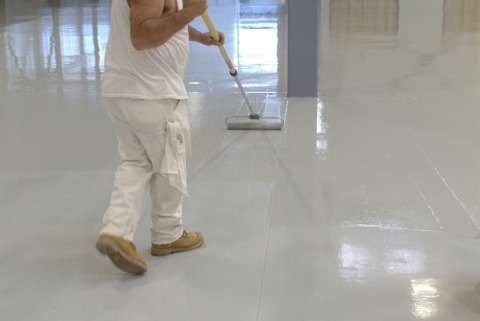 Since epoxy floor coating is a topical sealer, it also protects against dust commonly found in garages, which comes from the powder that cement floors can shed. Many garages are being converted to be used for things other than storing cars nowadays. Whether you are looking to convert your garage into an office, workshop, music or art studio, or simple car and gear storage, curing garage floor epoxy onto your otherwise unattractive and cold cement floors can make a huge difference in transforming your space into a shiny, clean showroom that serves all of your needs and interests. Use our garage floor coating services to give your garage floors epoxy or your walls a more durable finish. Our professional painters at Mahalo Painting offer services in Scottsdale, Paradise Valley, Fountain Hills, Cave Creek, Carefree, North Phoenix, and other surrounding areas. Call us today for a free estimate and to find out if we offer garage floor coating services near you!